The work done by PTP has been key for the adoption of two laws by the Parliament of Catalonia: “Llei 9/2003 de la mobilitat” (Mobility Act), pioneer in Europe and “Llei 21/2015 de finançament del sistema de transport public” (Public Transport System Funding Act), adopted unanimously. Urbanism in cities is strongly specialised on cars: the width of the lanes, the turn radius, one-way directions or parking have design parameters that can be detrimental to an efficient public transport. In Barcelona PTP achieved that the City Council will keep as two-way street for buses in two important streets, among other improvements for the bus in the Catalan capital as well as other cities. PTP works for a fare system to increase the public transport users with fidelity policies and without operators or zone frontiers. In 1993 we started the demand for an integrated fare and ticketing system in Barcelona that was achieved in 2001. From 2013 to 2015 we collaborated with protests from the “Stop Pujades” movement, that achieved a freeze on the price of public transport and we obtained a reduction on the price for recurring users for trips of 2, 3, 4, 5 and 6 zones in Barcelona. Tramway (light rail) came back to Barcelona in 2004 after years of reivindications and controversy during the construction. Today the tramway (light rail) has become the fastest surface transport in urban zones of the metropolitan area, attracting more travellers than any other new infrastructure, and has the best user satisfaction rating in mobility surveys. Between 2005 and 2007 we collaborated actively with “Defensem el Tren de l’Empordà” to save the central train station of Figueres, threatened of suppression and relocation to the city outskirts due to a speculative project. We have achieved to maintain the station on its place. Between 2002 and 2016 we have campaigned against the closure of the railway service between Port Aventura, Salou and Cambrils. We have been able to involve the Catalan government and the council of Salou in the project of adapting this line for a train-tram service. We oppose the closing of railway use of Barcelona France Station. In 2000 we carried the first studies to disassociate car use from car ownership through a carsharing project. In 2003, the creation of the “Fundació de la Mobilitat Sostenible i Segura (Safe and Sustainable Mobility Foundation) together with the Barcelona City Council and the Government of Catalonia aimed at promoting this project, that started in 2004 with the company Catalonia Carsharing (after Avancar). Nowadays two private carsharing operators are present in Barcelona: Som Mobilitat and Bluemove. PTP did the first studies showing an increasing deterioration (2003) and saturation (2005) at Commuter trains. In 2006 we participated in several demonstrations with labour and resident’s associations, obtaining a plan of urgent investments and a customer committee with Renfe, the rail operator. We achieved the 2nd plan for Commuter trains of the Democracy, but it has a low developing. With the Esparraguera manifesto (2001), we achieved the first political document asking for bus priority in a motorway in Catalonia: the B23 bus lane. In 2012 the Government of Catalonia opened a controversial HOV-bus lane with two unidirectional lanes on the C-58 motorway, with high construction costs and one way. 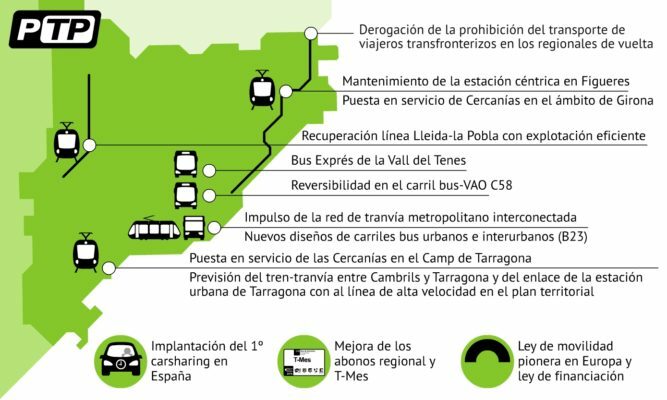 In 2013 the “Servei Català de Trànsit” (responsible for road safety and traffic management in Catalonia) accepted our proposal for accepting both ways for buses and HOV. After many years of demands for avoinding the closure of the Lleida – Balaguer – la Pobla line, we achieved its transformation into a modern service by the hand of Railways of the Generalitat of Catalonia. This is a low demand line where low cost operation measures have to be applied. We have promoted one of the most important transformations of a bus network in Europe, the Nova Xarxa Bus. Since a set of historical and overlayed lines, a main network has been created operating at an interval of 5 and 8 minutes, and covering all Barcelona in four directions. Thanks to the work of assocations from both sides of the Pyrenees, including the PTP, we have achieved the elimination of the ban on passenger traffic in the transborder section for the Renfe regional trains and SNCF TER trains coming back.